After her fiancé breaks her heart and humiliates her on what was to be their wedding day, Ella Dubois has vowed never to open her heart again. Nickoli Vesa, a Romanian pianist, has loved Ella for years, but she only sees him as her long time friend. 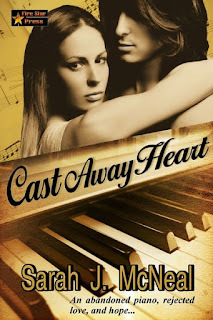 How can a deserted piano heal a shattered spirit and inspire it to sing again? There it stood like a brave soldier, silent in its despair and covered in snow. One of the ornately carved legs had rotted away and lie on the ground beside it causing the piano to list to that side. It resembled an old ship that had taken a huge wave and, as the water began to fill its hull, was sinking slowly into the sea. The wooden underside of the keys had begun to swell and dislodge from the smooth white pads. The black keys had eroded into splinters and the top of the piano had caved in on the piano wires. Ella choked back a sob at the sorrowful sight. How could that awful man watch this happen to such a beautiful instrument? The piano could have brought the joy of music to so many. How much hatred could he possibly have to find delight in watching the destruction of his wife’s piano? What a despicable human being. The excitement of anticipation shot through her. It was thrilling just to think of lying in his arms maybe even naked. She had not seen Nickoli without his clothes. Curiosity burned along her veins in surging rivers of stirring need. His hand tightened on her arm and she looked up to see him smiling down at her. The devilish man seemed to guess her every thought. Well, he was about to see a new side of her tonight. If they were going to pretend to be engaged and in love, what harm could there be in having a little fun? In the back of her mind, she had always wondered what Nickoli would be like in bed. Well, maybe it was time to find out. “What would make you happy then?” Nickoli asked the question quietly. “I want to take a boyfriend with me, a fiancé, actually. Well, not actually a real boyfriend except that they would think he is my boyfriend.” She could barely make herself go on. Nickoli’s face seemed to pale, and his eyes darkened though he remained silent. “You want to pretend.” He seemed to put a strange emphasis on the word that made Ella’s stomach clench. “Well, yes. Would it be that hard for you to pretend to care for me that way?” A little knot formed in her throat that hurt her, reminding her of Mark and his casual disregard for her feelings. He was such a dear. He was like a comfortable pair of shoes that never pinched your feet. “Wonderful. Oh, thank you, Nick. You’ve saved me.” She leaned toward him and kissed him on his mouth. His firm lips responded, kissing her back, and a little thrill ran up her spine and quickened in her chest. The music spilled from the heart of the baby grand and poured its sorrow on Ella until she didn’t think she could bare the terrible loneliness of its mournful sound another moment. Her eyes welled with tears. Her own deep, unrelenting sadness came to the surface and ate at her heart. The piano stood in dignified repose like a stalwart soldier waiting for orders, but all the while knowing there will be no further orders, no further requests for its talents. Ella felt the love of her life had done the same to her and she, like the piano, must press on with whatever dignity she had left. How long would the piano suffer like this? How long would she?